Now she has the paper to prove it! Big congratulations are in order for our Creative Strategist and long-time aasmanite, Eleanor, who has just graduated from her Master's program! We are very proud of her and wanted to take this opportunity to ask her a few questions about her grad school experience. A: First can you tell us the how, what and where? What did you get, where did you get it and a bit about the program in general? E: Whew. That’s a lot of questions right up front. I’ll try to be brief in talking about the last two years! 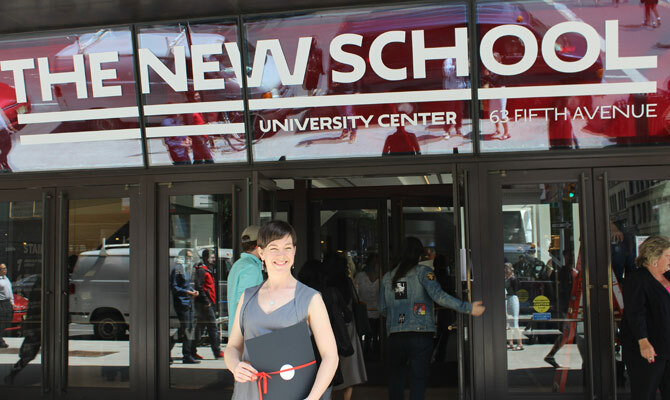 The degree is a Master of Science in Strategic Design and Management from Parsons School of Design in New York City. The program teaches design thinking and business innovation. A: What was your favorite part of the Grad school experience? E: Hands down, being in New York. The valedictorian at the Graduation Ceremony described the city as a professor that all students share and I think that is true. Inspiration finds you everywhere. I went to conferences on design, the history of international picture books, personal branding and more. Some were put on by the school but many weren’t. A: What new skills do you bring to aasman? E: Mastering remote working is certainly a new asset. For the past year I’ve been working in Whitehorse from Brooklyn. But more importantly, my arsenal of design tools is bursting at the seams. Three key concepts include human-centered design to ensure your target audience is your most critical expert; prototyping as part of early concept development; and agile design methods to manage flexibility within long-term solutions. Before I applied for the program I found myself advising clients on how to modify their businesses based on their brand values, but because my background was in communication design and not in business I felt uncomfortable in the business realm. That’s been replaced by confidence. Want to talk about your business model? Ask me! Aside from the business angle I should mention the work we did with social innovation. Social marketing is some of my favourite work to do at aasman – many of our government clients are helping Canadians change their ways for the better. A number of my classes dove into theories of change, researching community issues, and ways to resolve them through design thinking. I had a class at the global innovation consultancy, IDEO. 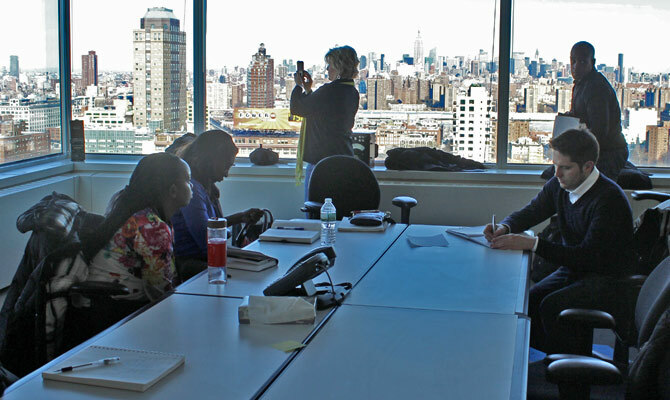 I worked with a clean energy accelerator NYCACRE. I pitched ideas to tech venture entrepreneurs alongside financial analysts, start-up owners, and graphic designers. I designed a business that helps retirees become self-employed or find part-time work. 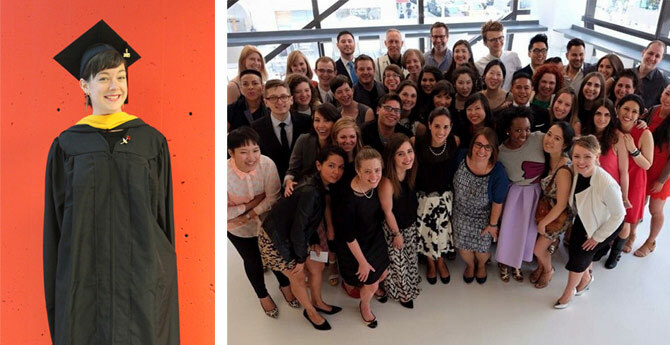 All of these experiences have added immeasurably to my work as a creative strategist here. A: How does it feel to be finished? E: My head is spinning with buzzwords and I’m still trying to shake the anxiety of constant deadlines. But I feel fabulous – excited about making positive change in the world. E: A month of school-free New York City! Wahooo! If you’re in town, drop me a line. On Canada day I’ll begin my journey back to the West Coast of Canada and I’ll be setting up my remote aasman office in Vancouver. Then, in July, up to Whitehorse for a few weeks! A: Do you have any advice for others looking into this field of study? E: One of my professors would always tell us “I don’t care what you think – prove it,” and frankly that makes a lot of sense. Many people consider design to be an intuitive art, one where a mysterious muse is responsible for great results, but that is far from the truth. Like a science, design thinking is founded in research, experimentation and synthesis. It’s about trusting a process that’s based on discovery. It can appear risky because the systematic approach requires that you not know the answers at the beginning of a project – so scary, but so valuable! The last time I felt so proud was when one of my own kids graduated! I love the way you managed your studieswhile contributing in a meaningful way to the ongoing work at Aasman. Terrific achievement, Eleanor, well done! Aw shucks Al. Thank you! That’s very kind to say. Yah, what Al said. (Micah graduated from preschool last week so I totally relate to the whole pride thing) Serious props, Eleanor. A big congratulations Eleanor, a huge achievement. All this, while you were so present in our office…could hear your voice daily coming from someone’s computer. Hope you can share your new knowledge and understanding to challenge and educate those around you. How exciting to now enjoy a wonderful city school-free. A little jealous here… Really hope to connect with you when you are up in Whitehorse. Big hug! !